Today I added a headstone photograph to the page of Early Settlers Cemetery ~ Herr Heinrich Moser Sr., Moser River, Halifax County, NS. There are only three headstones with inscriptions in the cemetery and, with this addition, they have all been added to the Inscription page. The other grave markers are blank crosses. 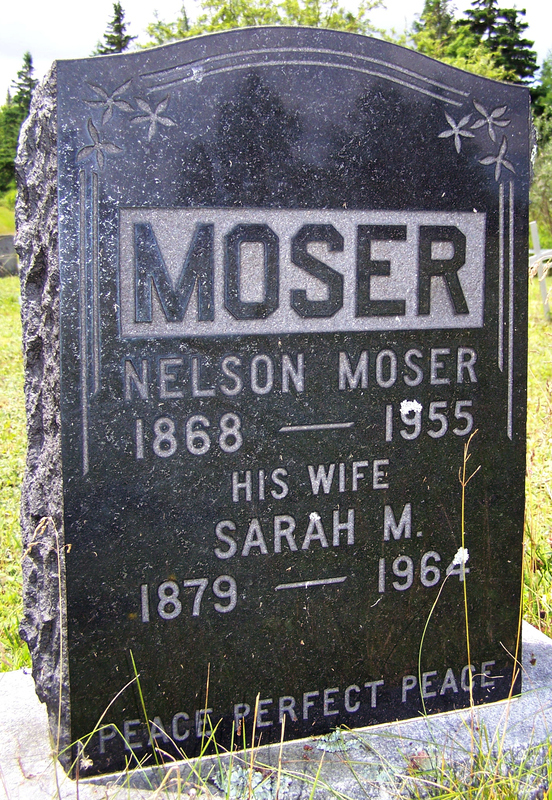 According to his birth record, Nelson Moser was born June 16, 1868 at Moser River. He was the son of Sophia Hawbolt and Ephraim Moser, who was a ship carpenter. Sophia and Ephraim married in 1865 at Moser River. According to his marriage record, Nelson and Sarah Matilda Moser wed on July 5, 1894 at Moser River. Nelson was 24 years old and working as a fisherman. Sarah was the tender age of 15. She was born at Moser River, the daughter of Catherine and William Moser. In the 1901 Census, the family was recorded in Smith Cove. Matilda S. (age 22; born April 4, 1878) and Nelson (age 32) had four children: Anna P. (age 7), Norman V. (age 5), Elizabeth (age 3) and Edith M. (age 1). Ten years later in the 1911 Census, Sarah (age 32; born 1879) and Nelson (age 43) had five children in the house: Norman (age 15), Bessie (age 13), Viola (age 9 or 4), Sylvester (age 3) and Raymond (age 11 months). Anna P. and Edith M. were missing from the census. Perhaps they passed away. Anna may have married. She would have been 17 years old. Edith would have only been 11 in 1911. Nelson died on August 3, 1955 at Moosehead, Halifax County, NS, at the age of 89 years. Sarah passed away nine years later on August 28, 1964 at Moosehead. She was 86 years old. According to her death record, she was born April 27, 1878 at Moser River. Her parents were recorded as Catherine McDonald and William Moser. Atkins, Alfred Suttis: Born May 25, 1892 at Harrigan Cove, Halifax County, NS, the son of Francis Kaiser and James Richard Atkins.